STOP! If you have just arrived at this website looking for ebb and flow fittings, you might want to go back to Part 1 of this mini-farm ebb and flow plan. 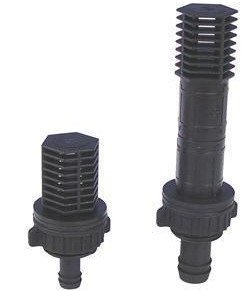 Below is what the fittings for the drain table look like. They comprise the major plumbing for this system. 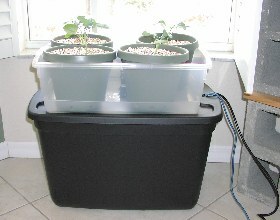 The shorter pipe allows the fluid to flow up into the planting bed. The taller one acts as an overflow valve. When the level of fluid reaches the slits, it starts to drain back down into the reservoir, preventing the table from overflowing its sides. The overflow tube in this photo has 2 extension pieces on it. We only use one extension for this project, so it won't be this tall. You can order the complete kit here for a few bucks: Ebb and Flow Supplies. 1. 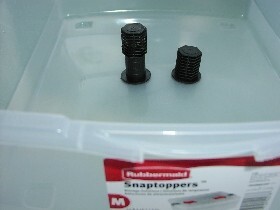 Cut two 1-1/4” holes in the center of the clear Snaptopper tray. Smooth the rough edges lightly with a file or sandpaper. 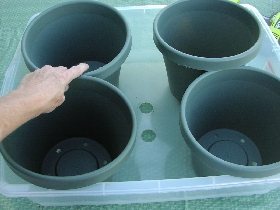 Your 4 pots need to fit around these 2 holes, see below. 2. 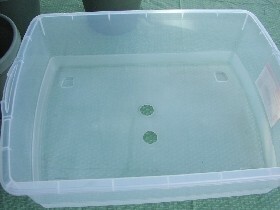 Place clear tray on top of the black tote lid, and center it carefully both ways. 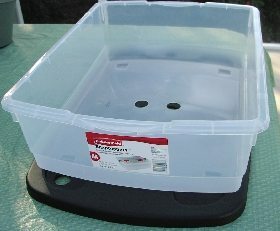 Mark the exact center of each hole in the tray onto the black lid with a marker. 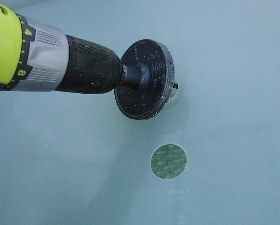 Then cut two 1-1/4” holes in the black lid where marked. 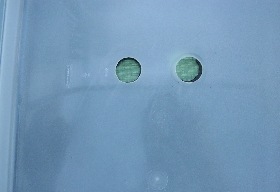 The idea is to line the holes up in each piece as shown below, right. -One is for the pump plug and bubbler tubing to pass through. -The other is to check the fluid level and to add nutrient solution after assembled. 4. Screw the two drain fittings into the center holes in the clear bin only. 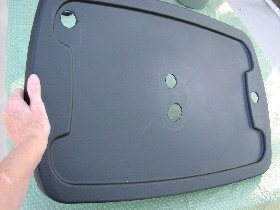 The rubber gasket goes on the underside of the bin. Hand tighten securely, but do not use tools or you will strip them out. Place ONLY ONE extension on the overflow tube (the thicker, 3/4” tube), as shown below.